NASA's Interstellar Boundary Explorer, the centerpiece of a $169 million mission mapping the frontier of the sun's influence, has detected atoms from interstellar space streaming by Earth, that are different from the chemical make-up of the solar system, scientists announced Tuesday. The IBEX satellite observed hydrogen, oxygen, neon and helium atoms that originated in interstellar space, the vacuous medium between stars in the Milky Way galaxy and found 74 oxygen atoms for every 20 neon atoms in the interstellar material, compared with 111 oxygen atoms for every 20 neon atoms inside the solar system. Most of the interstellar medium is made up of hydrogen and helium. Heavier elements, such as oxygen and neon, are spread by exploding supernovae at the end of a star's life cycle, according to NASA. "We've directly measured four separate types of atoms from interstellar space and the composition just doesn't match up with what we see in the solar system," said Eric Christian, IBEX mission scientist at NASA's Goddard Space Flight Center in Greenbelt, Md. "IBEX's observations shed a whole new light on the mysterious zone where the solar system ends and interstellar space begins." The data hints that the region of interstellar space just outside the solar system may be deficient in oxygen compared to its abundance inside the heliosphere –a teardrop-shaped bubble blown out by the force from the solar winds that blocks most dangerous cosmic radiation from reaching Earth. "Our solar system is different than the space right outside it, suggesting two possibilities," said David McComas, IBEX principal investigator, at the Southwest Research Institute in San Antonio. "Either the solar system evolved in a separate, more oxygen-rich part of the galaxy than where we currently reside, or a great deal of critical, life-giving oxygen lies trapped in interstellar dust grains or ices, unable to move freely throughout space." The sun and the planets are speeding through the galaxy at more than 500,000 mph. The solar system is now traveling through a region known as the local interstellar cloud, and it's expected to emerge from the local environment and enter a new region of interstellar space in a few hundred to a few thousand years, according to McComas. Scientists say the local cloud is particularly tenuous. It is less dense than surrounding interstellar clouds, so thin that the atoms in a handful of air could stretch in a column hundreds of light years long. Previous measurements of interstellar helium atoms by the Ulysses spacecraft indicated the solar system may be emerging from the local cloud. But the latest IBEX data, which detected incoming atoms moving at a slower speed, show the heliosphere is still embedded within the local cloud. "Measuring the pressure on our heliosphere from the material in the galaxy and from the magnetic fields out there will help determine the size and shape of our solar system as it travels through the galaxy," Christian said. Only neutral interstellar atoms can enter the heliosphere, piercing the furthest reaches of the solar system and racing toward the sun for 30 years until arriving in the vicinity of Earth for detection by IBEX. Charged atoms are deflected by the sun's magnetic field and do not reach the inner solar system. IBEX, launched in October 2008, is in an orbit stretching 200,000 miles from Earth, placing the craft outside of the planet's magnetic field, a requirement to detect energetic particles streaming in from the outer heliosphere and interstellar space. 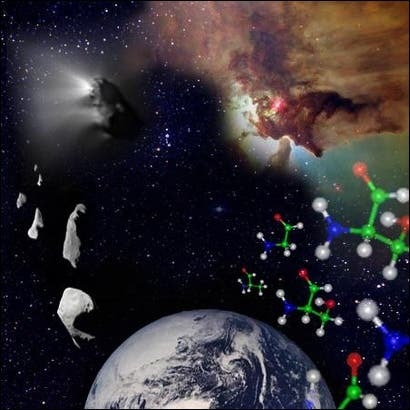 The image at top of the page shows that many of the ingredients for life formed in outer space. The Earth formed from star dust, and later meteorites and comets delivered even more materials to our planet. But scientists are still unsure which molecules played the most important roles in life's origin.